As a kid, Monkey D. Luffy vowed to become King of the Pirates and find the legendary treasure called the "One Piece." The enchanted Gum-Gum fruit has given Luffy the power to stretch like rubber-and his new crewmate, the infamous pirate hunter Roronoa Zoro, strikes fear into the hearts of other buccaneers! But what chance does one rubber guy stand against Nami, a thief so tough she specializes in robbing pirates...or Captain Buggy, a fiendish pirate lord whose weird, clownish appearance conceals even weirder powers? 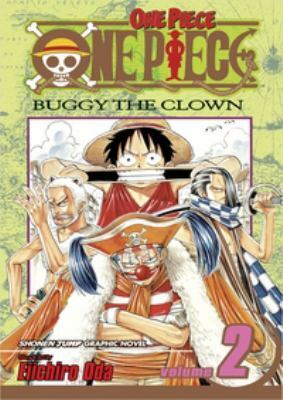 It's pirate vs. pirate in the second swashbuckling volume of One Piece!Eiichiro Oda is the author of 'One Piece, Vol. 2: Buggy the Clown', published 2003 under ISBN 9781591160571 and ISBN 159116057X.